Best-known for his seminal sf novel Neuromancer, William Gibson is actually best when writing short fiction. Tautly-written and suspenseful, Burning Chrome collects 10 of his best short stories with a preface from Bruce Sterling, now available for the first time in trade paperback. 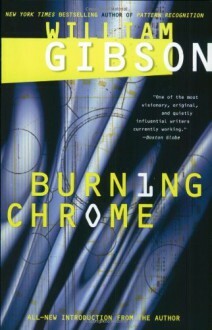 These brilliant, high-resolution stories show Gibson's characters and intensely-realized worlds at his absolute best, from the chip-enhanced couriers of "Johnny Mnemonic" to the street-tech melancholy of "Burning Chrome." This collection of short stories is a great introduction to the Sprawl. I highly recommend this as it will give a greater understanding of the follow-on trilogy.